Baltic Europe is a fascinating and beautiful region. Once part of the Soviet bloc, today these countries are flourishing and offer travellers unforgettable experiences. I learned this almost two years ago when we travelled as a family to Latvia and Estonia. At the time I regretted not having time to also explore Lithuania, so I vowed I would make that dream trip a reality. 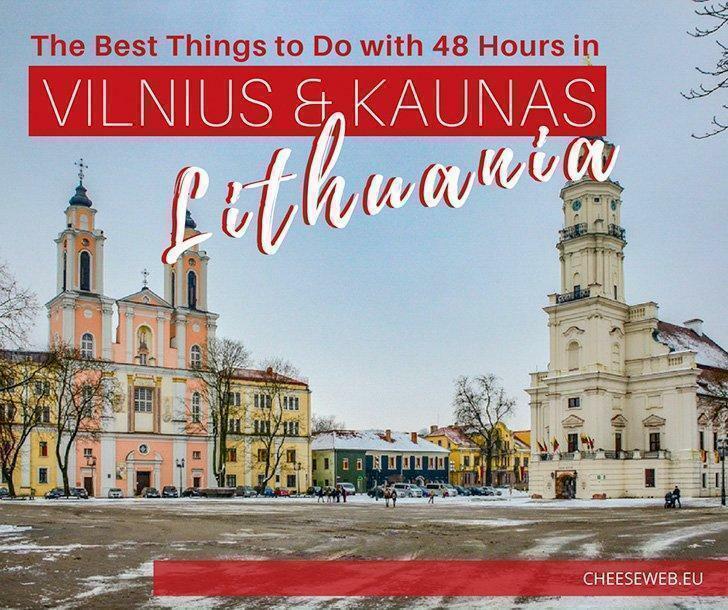 This past February, hubby and I took a little time off for a romantic getaway and set off to the last country on my Baltic Region list, Lithuania. A view of Vilnius’ skyline from the 3 Crosses monument. 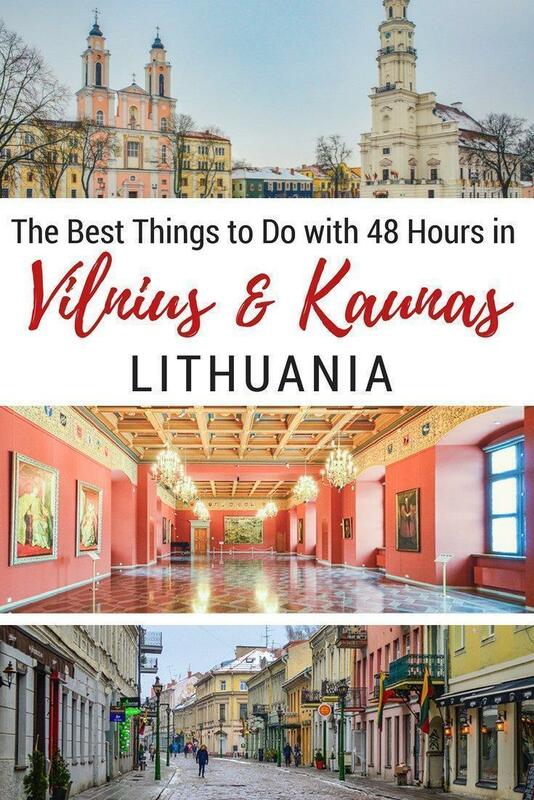 Lithuania is the southernmost country of Europe’s Baltic states, and its capital is Vilnius, a town renowned for its medieval Old Town adorned by Gothic, Renaissance and Baroque architecture, and a stunning 18th-century cathedral. The best flight deals I could find were mid-February, right on the country’s Independence Day. Imagine our delight when we saw the little flags on the plane, and a grand fireworks party waiting for us in the centre of the town upon our landing. We arrived in the evening, and as soon as we got our Airbnb key, we took off to enjoy the fireworks. For our 48-hour stay, we found an affordable, cozy and immaculate studio apartment, not far from the centre of the town. 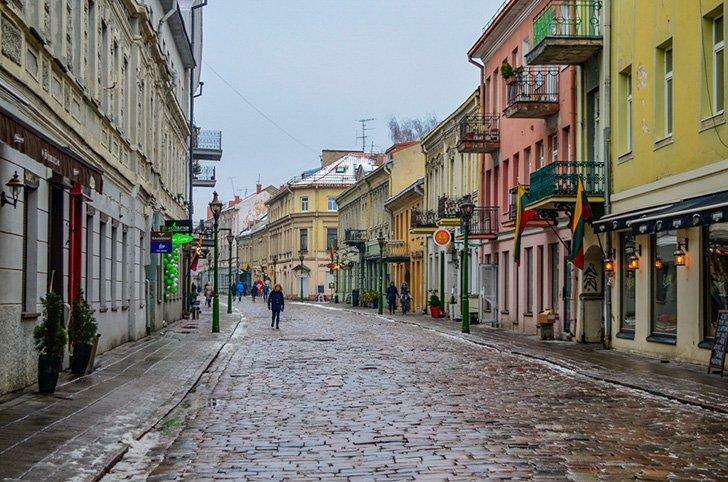 Being that it was a celebration weekend and winter not many tourist attractions were open, but we did manage to visit a few points of interest in Vilnius as well as Kaunas, Lithuania’s second largest city. 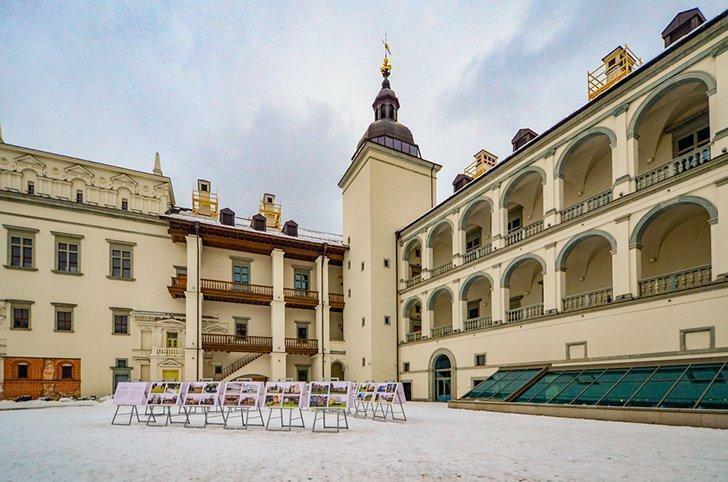 The palace proudly stands right in the centre of Vilnius, in the Cathedral Square known as the heart of the city. Its history dates back to the country’s most majestic times, and many of the Grand Dukes of Lithuania once resided here. The Palace has burned down more than once and has changed in architectural appearance many times until at one point it was completely demolished. 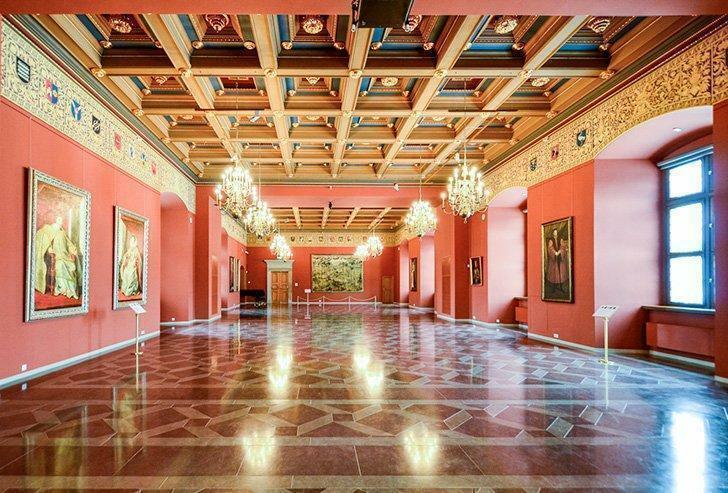 However, after 200 years of nothingness the Palace was revived, and today it invites you to visit. Visiting the palace in winter is a breeze as there are few visitors. Admission is inexpensive, and the tour is a pleasure due to the ease of movement inside the ruined area as well as at the rest of the floors. 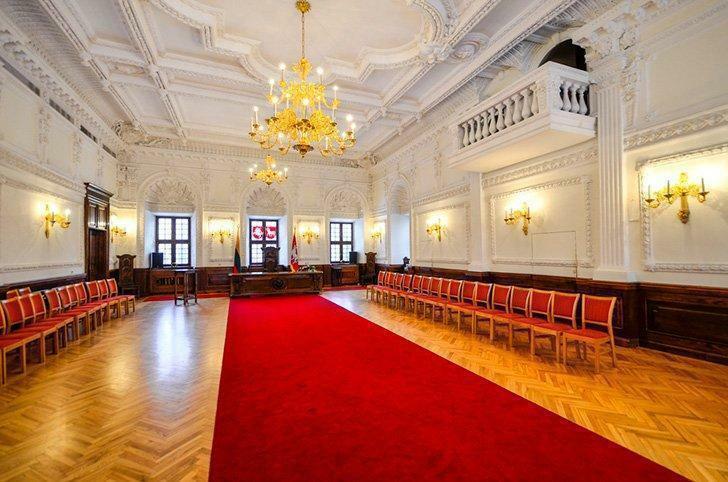 I strongly recommend spending some time in the media area as they offer virtual reality mini historical tours where the history of the palace is explained in multiple languages. It was my very first experience with VR, and I must say I loved it. 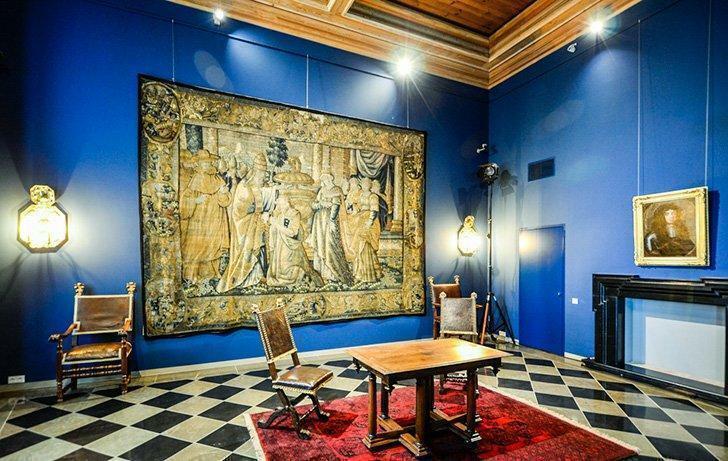 The rest of the palace consists of lavishly ornate rooms decorated with massive paintings and rich tapestries. 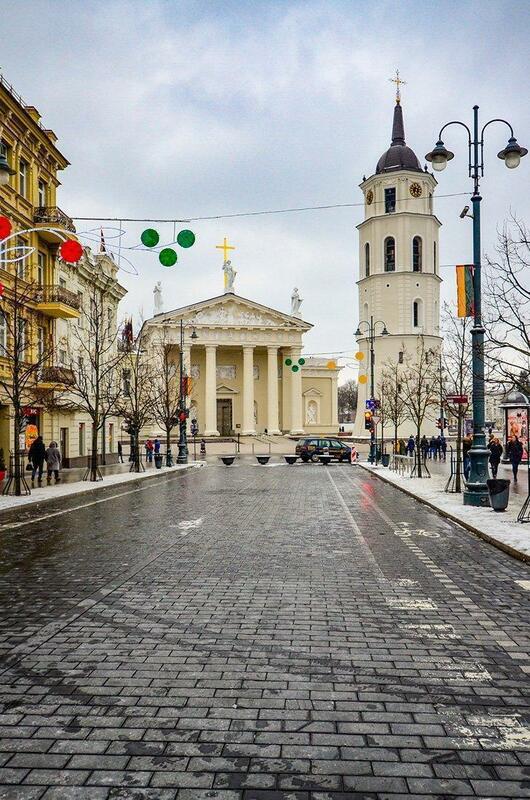 Visiting Vilnius Cathedral is one of the best things to do in Vilnius in winter. The façade of the Cathedral is striking and considered to be among the most beautiful cathedrals in the world. 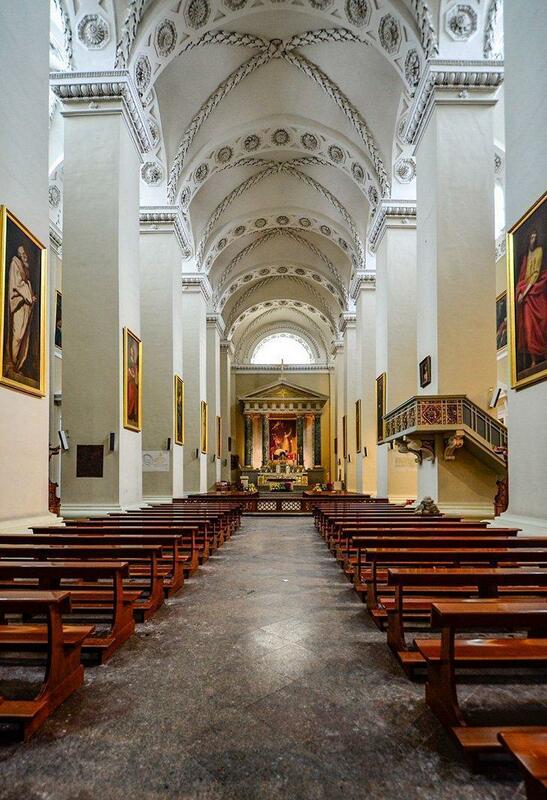 It is a classical masterpiece in Vilnius. Like the Palace, Vilnius Cathedral was repeatedly destroyed and burned; now it proudly stands in the very heart of Vilnius Old Town. In front of the cathedral stands the 57m tall bell tower. It is the oldest and best-preserved tower of the city’s defensive wall. It contains ten brass bells, cast in the 16th and 18th centuries by Dutch and German masters. A quirky thing about this location is next to the bell tower, on the pavement, you will find an exclusive tile. Local tradition says if you make a wish and turn around three times while standing on the tiles your wish will come true. Try it and you maybe your inmost desires will become a reality. 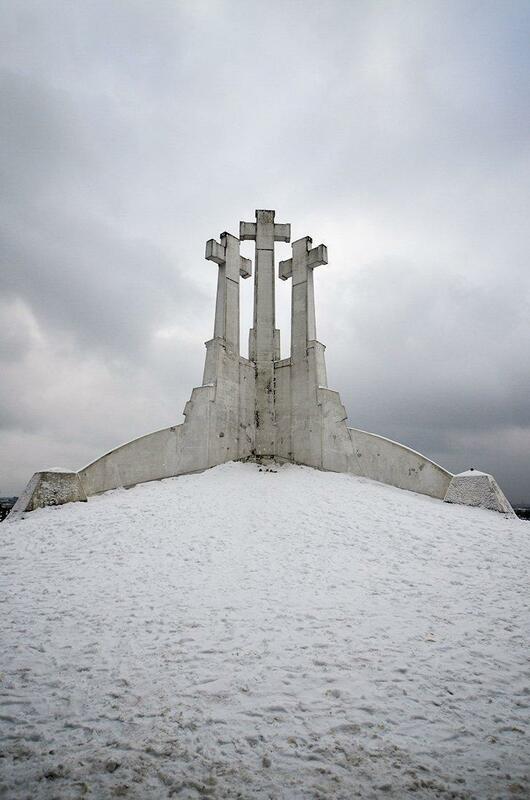 Don’t miss the hike to the three crosses monument; one of the top things to do in Vilnius. The hike to the monument was one of my favourite things to do in Vilnius. According to legend, seven Franciscan friars were beheaded on top of this hill. Wooden crosses were built on the location since the early 17th century. In modern times they have been replaced by concrete ones. The monument became a symbol of Vilnius and an integral part of the city’s skyline. The way there is somewhat precarious due to a series of sturdy but pretty scary steps. I had hubby hold my hand the entire time because it would have been a very long fall down. But don’t let this deter you from visiting, just pay attention to your footing. The way up is forested, and because it had been snowing heavily all that day, the surrounding park and forest were dressed in white and fresh snow was crunching under our feet. Once at the top the view over the city is quite a sight. The Museum of Genocide Victims is dedicated to the thousands of Lithuanians who were murdered, imprisoned or deported by the Soviet Union from WWII until the 1960s. Memorial plaques honouring those who perished tile the outside of the building. 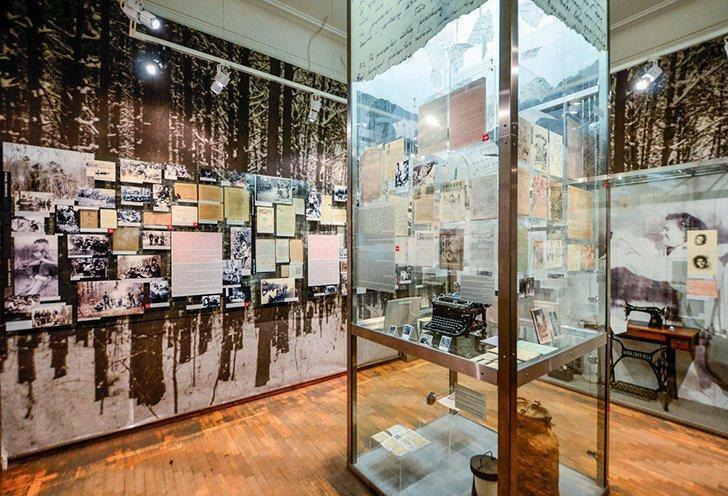 Inside, the exhibits cover the harsh realities of Soviet occupation, including gripping personal accounts of Lithuanian deportees to Siberia. The basement of the KGB Museum is the stuff of nightmares. 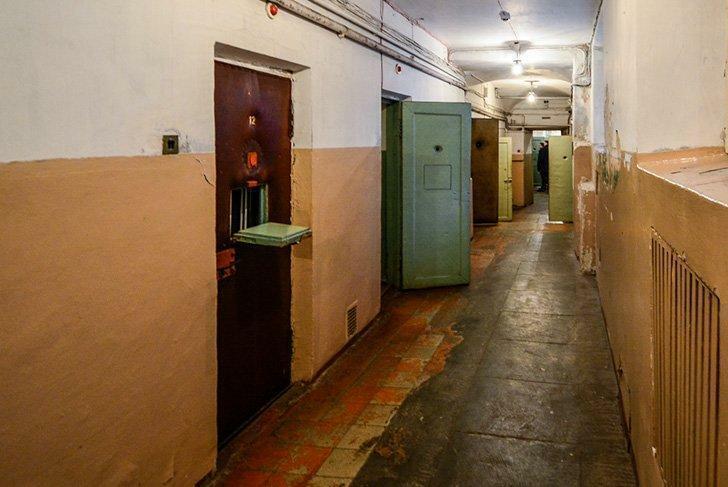 The basement of the museum, a former KGB prison and place of torture will haunt you. It is truly a place of nightmares. Although it is not a pleasant sight, one must visit to learn about the harsh reality of those times. It left us deeply saddened and frankly, horrified by the atrocities committed by the Soviet regime. 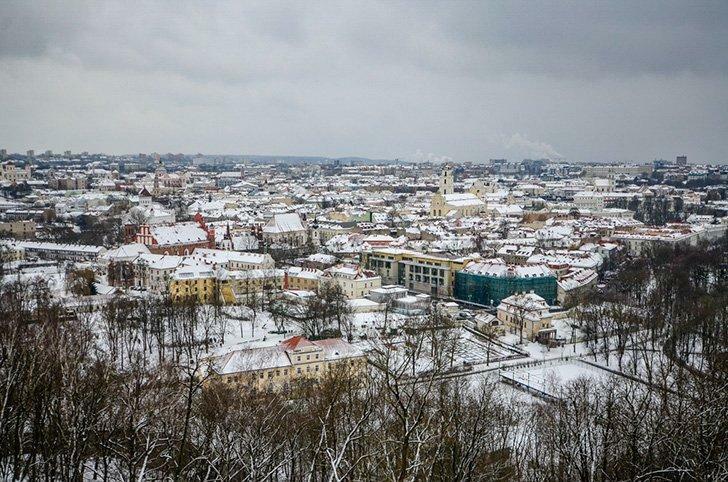 One of my wishes during our short stay in Lithuania was to visit the city of Kaunas, the country’s second-largest city. I had seen beautiful images of Kaunas, and I simply had to experience it myself. Getting from Vilnius to Kaunas is easy and affordable. All you have to do is go down to the main bus station in Vilnius and take the next bus to Kaunas. Buses leave every hour, and the ticket is 6 euro for a roundtrip. Because we travelled to Kaunas in winter very few venues were open, but we did manage to squeeze a visit to Kaunas Castle, the basilica and the Town Hall. 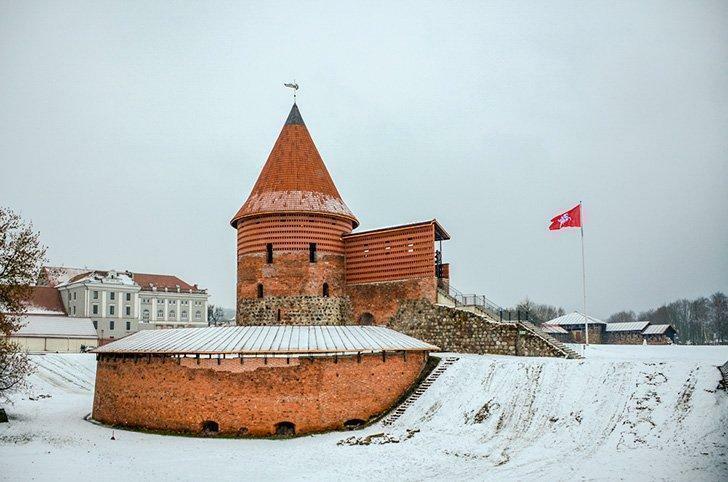 The castle, one of the main attractions in Kaunas, was built in the 13th century, in the beauty of the surrounding confluence of the Nemunas and Neris rivers. It is believed this castle, defended by the large and well-armed Lithuanian armies, blocked the way for the Crusader expansion to the depths of Lithuania and its capital city Vilnius. Visiting it was again a pleasure, in that it was not swamped by tourists – one of the main reasons we travel offseason. There are fascinating exhibitions, including a history of the castle spread over five spaces within the tower. There is a small entrance fee for visiting the castle. The interior of Kaunas Town Hall, also called the White Swan. The Town Hall referred to as the “White Swan,” is distinguished by its slenderness and grace. Its 53m tower the is the highest in the old city. The present Town Hall located in the main square was not the original. The first one was destroyed by fire. Tip: if you visit the Town Hall on a Saturday, be advised there are many civil unions and wedding photos taking place. Visit it 30-45min before closing time. You will have the entire building to yourself. There is a nominal fee to enter. 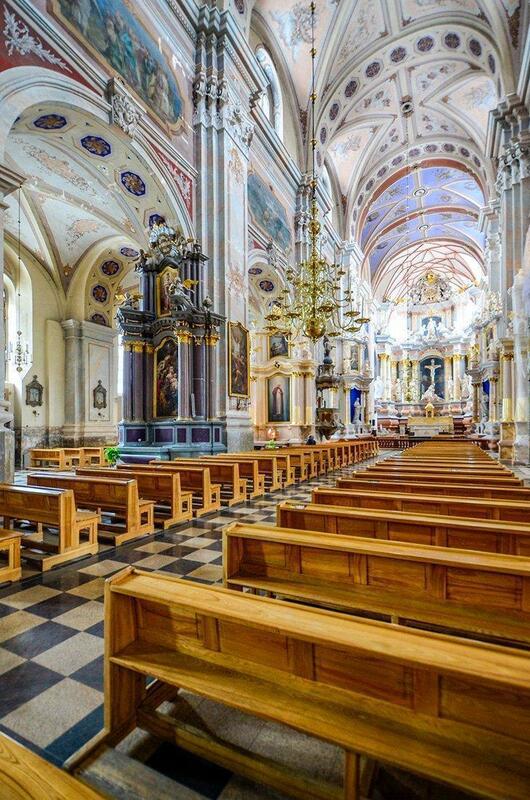 The Cathedral, also known as St Peter and St Paul Cathedral, is a Roman Catholic cathedral basilica and it was included into the Registry of Immovable Cultural Heritage Sites of the Republic of Lithuania in 1996. It is the only basilica in the Gothic style and the most prominent Gothic sacral building in Lithuania. Entrance is free. The food in Lithuania was quite the culinary adventure. Although traditional Lithuanian cuisine is rather simple, it has a variety of interesting dishes, many of them hearty and suitable for those cold Eastern European winters. Rye, potatoes, various meats, beetroots and turnips, mushrooms, berries, and dairy products are often used when preparing Lithuanian food. A few of the most memorable restaurants are situated in both Vilnius and Kaunas. 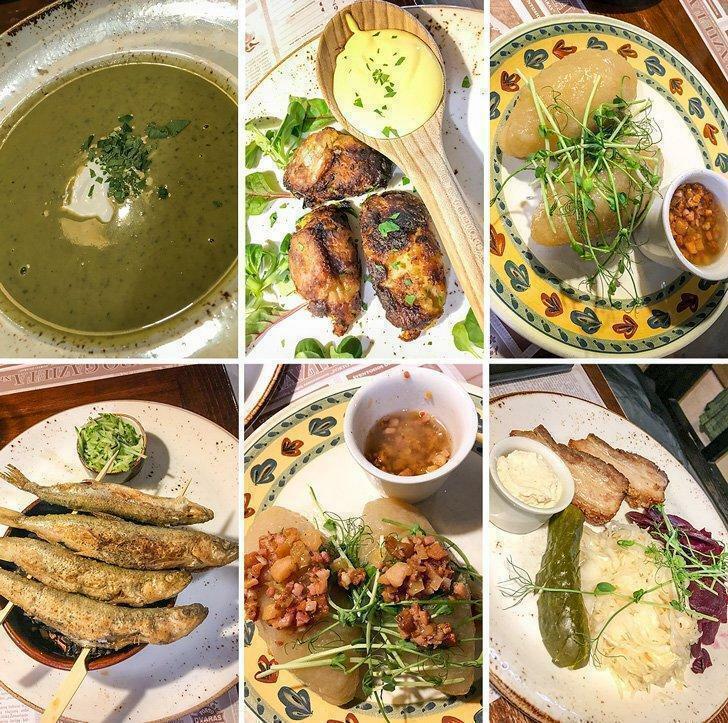 Situated in the heart of Vilnius, Forto Dvaras is a traditional Lithuanian restaurant that serves Zeppelin dumplings filled with pork, traditional soups, meat-heavy platters and even quirky snacks like pigs’ ears – something I have not eaten since I was a little girl. It reminded me of my Grandma and the pig slaughter at Christmas time, back in the mountains of Romania. Try it if you have the chance. It’s a chewy, smoky, delicious treat. The service is fast, the ambiance is charming due to the frescoes and traditional decorations, and the prices are easy on the wallet. 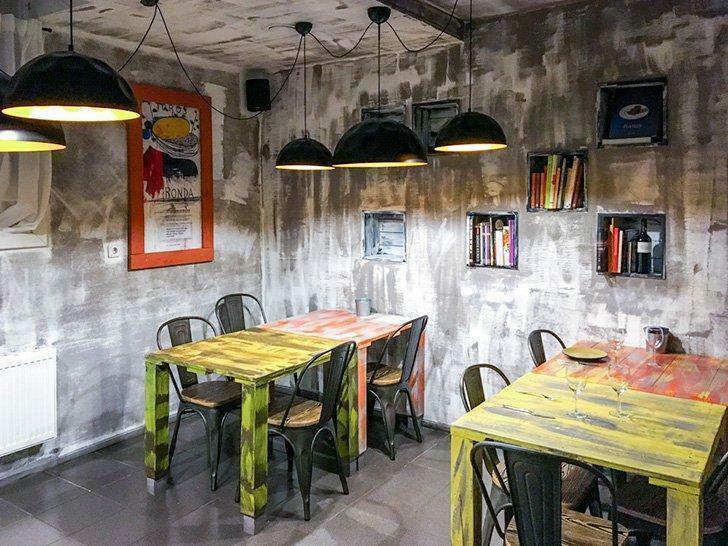 Give this place a try for an authentic Lithuanian culinary experience. 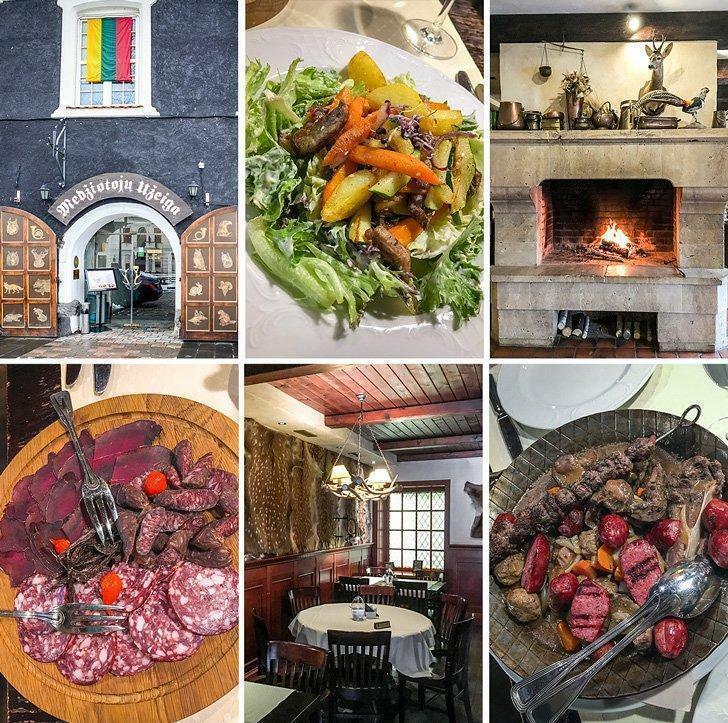 Medziotoju Uzeiga Restaurant in Kaunas Lithuania is known as The Hunter’s House because it features wild game on the menu. 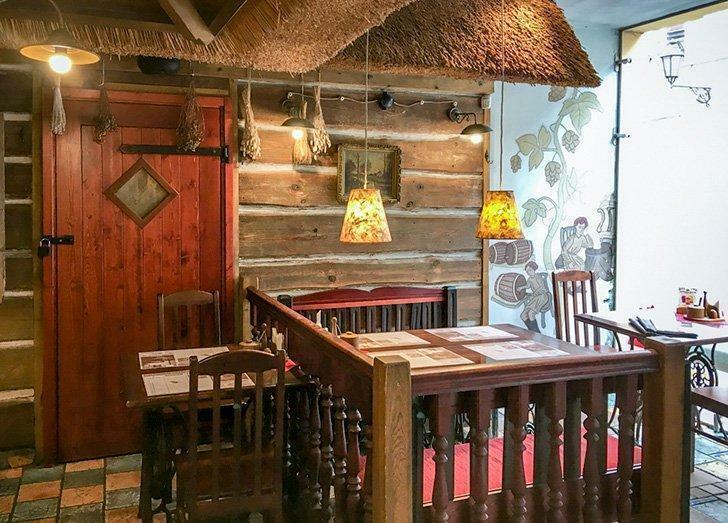 The Hunter’s House opened in 1965, and it is the perfect place to try wild game hunted in the forests of Lithuania as the primary goal of the restaurant is to use only fresh Lithuanian products. The meat selection is quite extensive and the dishes large enough to satisfy the most ravenous of appetites. 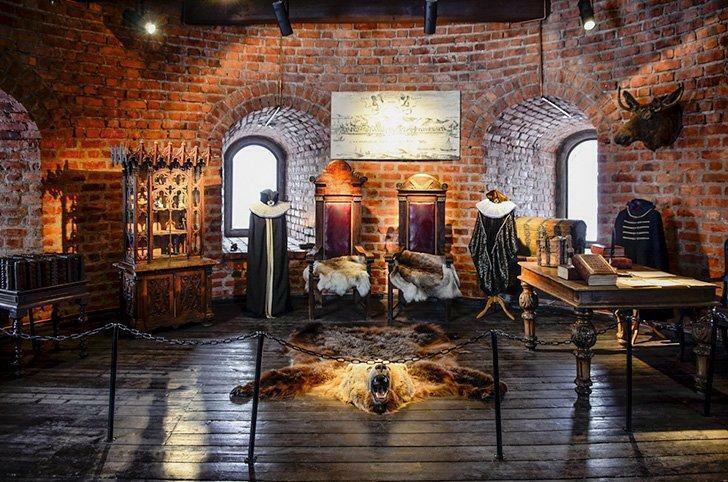 The interior is decorated in the style of a hunting lodge with many animal trophies and pelts on the walls. It is quite the sight. The service is fast and the prices affordable. L’Artisan Restaurant in Kaunas Lithuania features a fine dining menu. 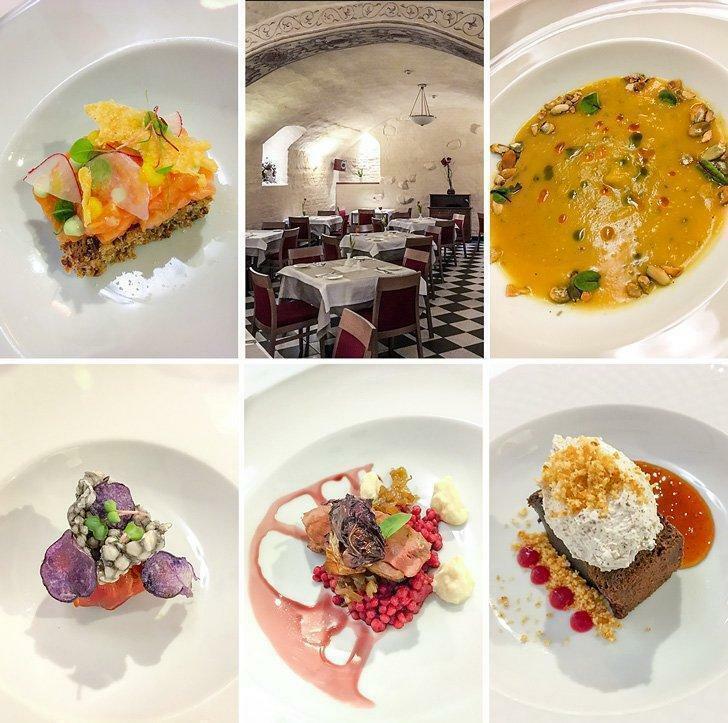 Situated in the 16th-century Gothic frescoed basement of the four-star Daugirdas Hotel, L’Artisan offers incredible menus in its four dedicated restaurant halls. At the time of our visit, they had an incredible dinner offer of a five-course menu for two for just 60 euro, an offer we could not possibly refuse. The service was a little slow, to begin with, due to new staff but picked up right after the first course. I cannot speak more highly of the menu. The Chef has turned every day Lithuanian dishes into a gourmet masterpiece. Do visit if you are passing through Kaunas. 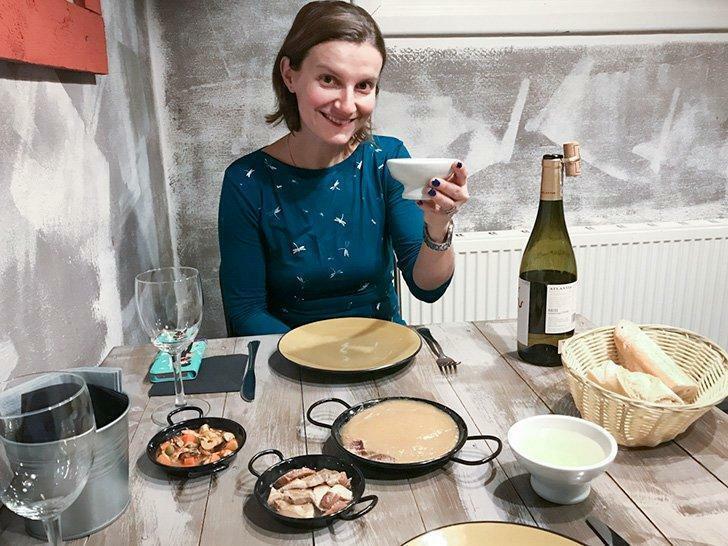 Adi’s pick for the best restaurant in Vilnius Lithuania is La Cocina de Jose, Spanish Restaurant. I saved the best, and my favourite restaurant, for last; A surprising restaurant right by our Airbnb in Vilnius. I say surprise because this restaurant had nothing to do with Lithuanian or Baltic cuisine and it would be an absolute crime not to mention it. 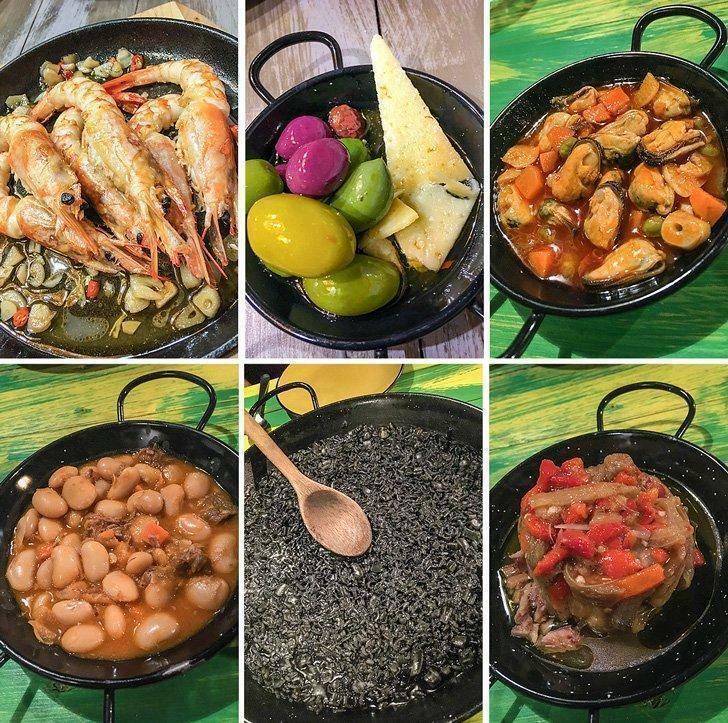 My favourite restaurant of all was a Spanish one, with food so good, I dare to say was better than what we experienced in Spain. We discovered La Cocina de Jose by chance the night we arrived in Vilnius. Because all the restaurants in the centre of the town were full after the fireworks display celebrating Independence Day, we decided to give this little place a try as it was just steps away from our rental. We had no idea our decision would take us to some of the most incredible food we’ve ever eaten. First off, Jose spoke impeccable English, and as soon as he heard that we were English speakers, he came to our table and asked us if we were hungry. We had not eaten all day due to travel and were famished. That is all he needed to hear. He did not offer us a menu but recommended the hot and cold tapas menu for two which we accepted right away. The mini dishes kept coming with incredible food for us to share. We could not believe our senses how fantastic everything was. He recommended a delicious bottle of wine to go with everything, and we could not be happier accompanied by the beautiful and rather sensual Spanish guitars playing in the background. La Cocina de Jose Spanish Restaurant in Vilnius Lithuania. I loved the restaurant so much that we ended our stay in Lithuania with another dinner. The same thing happened the second time too. We gorged on delicious tapas, drank incredible Spanish wine and because we stayed to the closing time we engaged Jose in a pretty fantastic conversation after he offered a second bottle of wine, on the house. It was the single most amazing and unique culinary experience of our travels. At departure, we even exchanged numbers hoping to see Jose again. I am not suggesting this will occur every time someone visits the restaurant but it happened to us, and I still think about it with fondness. I will most likely never forget Jose or his food. Who knew the best Spanish food would be in Vilnius, Lithuania? The intercity bus lines are clean and very inexpensive making travel between cities a breeze. We had such a good time in Vilnius we are now thinking of the next time we’ll visit. If you are looking for a wonderful and inexpensive travel destination, put Lithuania on your travel list.